This week West Suffolk Wheelers have been competing in a range of events from swimming and running in an Aquathalon, to a full-on Ironman challenge with the Vikings in Copenhagen, to battling the hills, humps and berms of the Mud Sweat and Gears mountain bike series. As usual, all Wheelers have been giving it their all achieving podiums and hard trained for personal bests. Round 7 of the series was held at Radical bikes in Chelmsford. The event saw 4 Wheelers take part in racing the MSG course which wound its way around the woodland that borders the site and included single track, flowing sections and many up and downs through the hundreds of bombholes. All in all, a challenging course. The MSG event series attracts professional and elite riders as well as attracting weekend riders and juniors. In the Boys Under 12 category Samuel Brook finished 16th completing three laps in 26 minutes and 54 seconds. 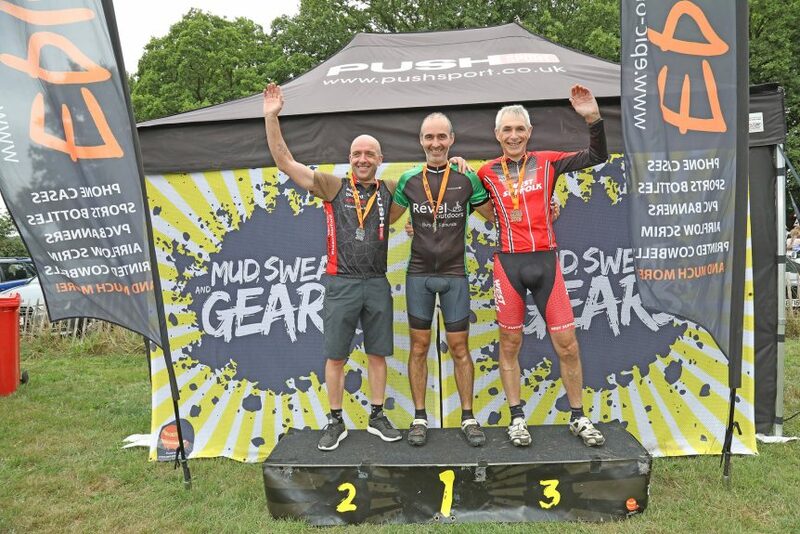 Stephen Brook & Chris Hinitt raced well in the open male finishing 46th & 63rd respectively and in the Grand Vets Paul Watson put in a fantastic ride and achieved a podium 3rd place finish completing seven laps in one hour, 31 minutes and 11 seconds. A tremendous well done to Tony read who completed his first Ironman this weekend in Copenhagen. He completed the challenge in 13 hours, 50 minutes and 7 seconds. A true day long effort but over a year of training and an amazing achievement. We had three WSW triathletes at the Infinity Aquathalon in Chelmsford. This was round 10 of 12 of the Triathlon England Eastern Region Children’s League. Izzy Duffin and Logan Marsh both competed in the Tri Star Start category with Dylan Marsh in Tri Star 3. Izzy continued her winning streak by coming 1st, Logan placed 2nd and Dylan came in a respectable 9th place. Well done all. It was a great event with friendly marshals and parents supporting the kids with their swimming and running. The club weekly time trial series continued with the short but tough Hawstead Hill Climb. There was a reduced field this week, perhaps because they knew Harley Gregory was attending. The youngster posted an impressive 1st run time of one minutes and 20.7 seconds and then managed to keep is second run competitive to take 1st place overall – 2:49.35. Second quickest over the two runs was Viv Smith with David Young only a second behind taking third overall. This short climb, starting in Pinford End and heading back towards Bury is easily accessible. While not the steepest or the longest, if taken at a sprint it’s a good challenge for anyone heading back to Bury from Maglia Rosso or the south of the district.